Posted on September 15, 2017 October 25, 2018 , in Hot Tubs. Deciding to buy a hot tub is a thrilling and exciting time, however, some people rush into buying without being fully informed of all the facts. Even times when you may feel that you are making an informed decision, there are several common hot tub buying mistakes that you want to make sure to avoid. It is critical to know what to look out for so that you can make the right decision and not regret it down the road. In this article, we will review the top buying mistakes to watch out for so that you can make the best decision. When you visit a showroom, it can appear that all hot tubs have similar exteriors. The truth is that the level of quality is not the same across all models. If you end up buying a hot tub that has a low-quality shell or cabinetry, chances are it will fade and crack quickly. Choose a hot tub that comes with a thermoplastic shell made from either vinyl ester resin skin, bond laminate or durable acrylic. Cabinetry should be designed to resist damage and extreme weather, be durable and low maintenance. Remember to ask about the warranty to ensure your hot tub is covered for its lifespan. Low prices can be enticing and may save you money upfront, but will end up costing more in the long run. Cheap hot tubs cost more money for necessary cleaning chemicals and are more likely to require repairs or have parts that fail sooner. Don’t make the mistake of making a decision solely based on price. Instead, consider what the lifetime costs of the hot tub will be. Higher quality models will be more expensive but will be energy efficient, require minimal maintenance and have a thorough warranty. Don’t purchase a hot tub until you have carefully considered where it will be located. Never choose an area that is prone to flooding or near sand as the mechanical parts can be damaged. It is important to always consult an engineer if you are planning to place your hot tub on a deck or patio to ensure that it will be properly supported. Hot tubs are heavy, in fact, they reach over 4,000 pounds once filled with water and people. An easy mistake to make is not asking about the warranty your hot tub has. Look for a reliable, comprehensive warranty that covers leaks for up to 5 years, surface for up to 5 years, and has structural and shell coverage for up to 10 years. Also, make sure that it includes parts for up to 3 years and covers labor. A solid warranty speaks volumes about the quality of the hot tub that you are purchasing and will help you save money by not having to replace expensive equipment. 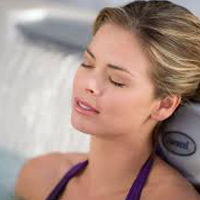 Massage jets along with the shape and comfort of a hot tub are what creates an enjoyable experience. Today, hot tubs have a wide range of therapeutic benefits that include stress reduction, helping with athletic injuries or insomnia and treating neck, back, and leg pain. Not all hot tubs are created equal and that is especially true of their therapeutic properties. When shopping for models, choose a jet structure which will provide a wide range of massage programs for various health issues and be adaptable. It is very important to always take the time to research your local hot tub dealer and read through previous customer’s reviews. Sadly, not all dealers provide the same level of support and service. Avoid purchasing a hot tub from an online dealer or at an expo as the units are usually low-quality and most of the time, the dealer does not have a local store in your area should you need product assistance or repair. Now that you are aware of what the most common hot tub buying mistakes are, learn more about what options are available by downloading our hot tub buyer’s guide.